Tashirojima, or Cat Island as it's often referred to, is a small island in Japan home to many elderly residents, along with stray cats, who now outnumber people. 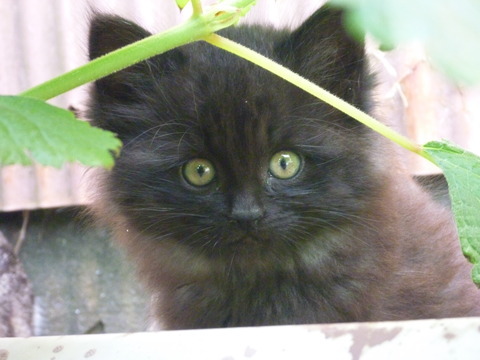 The cat population thrives due to the belief that feeding the cats will bring wealth and good fortune. There was much concern after March's earthquake and tsunami as to the safety of its human and feline residents; Fortunately, most of the occupants survived the natural disaster, but months later, are still in dire need of assistance. 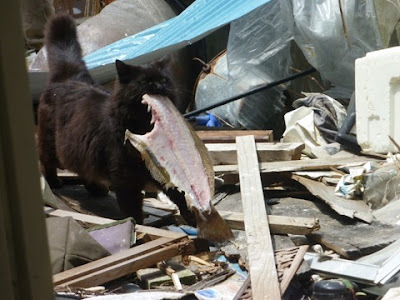 Back in April, a Japanese site called Response posted some of the first encouraging images of the cats after the earthquake, and a recent Japan Probe post has uncovered more details about the current situation. "Cats outnumber humans on a remote island in Miyagi Prefecture that was hit by the March 11 tsunami, and although the two-legged residents are busy rebuilding from the disaster, they have sent out a call for special donations to help feed their four-legged friends. Fishermen and other residents of Tashirojima island established the fund so cat-lovers nationwide could help its population of 100-plus felines. The islanders have vowed to rebuild their lives so both cats and humans can live in peace. Yutaka Hama, a 52-year-old fisherman who runs the Ryoshi Minshuku Hamaya inn, said more than 10 cats have been missing since the disaster, but most escaped to the hills before the tsunami hit. 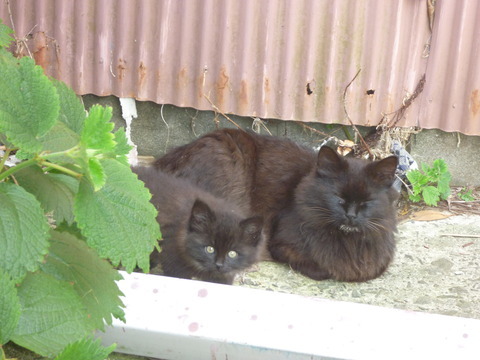 But cats are now rarely seen near the port, possibly wary of another devastating wave. The island's fishermen have not been able to work since the disaster. Since the cats were usually fed with tiny fish from their catches, they now have to rely on cat food donations. The situation prompted Hama and other islanders to ponder how they could collect funds to both rebuild the fishing industry and keep their furry friends fed. In their plan, which focuses on the nation's cat-lovers, people can become owners of oysters and other marine products the island produces in exchange for aid money. Donations are accepted in 10,000 yen lots, and Hama and his fellows aim to collect 150 million yen. Contributors will receive oysters and cat-related goods from the shrine. The cats will also be featured in a blog." You can visit the website for the Tashiro Island project here - http://nyanpro.com/index.html, but unfortunately it's only in Japanese, and according to Japan Probe, does not appear to be set up to accept international donations at this time. If possible, when donations open up will you post the link on your blog. I'd love to help as soon as possible :). I love the cat carrying that huge piece of fish. Hello there! We love this blog. It's absolutely fantastic. Tashirojima sure is a magical place. Reminds us here at CATS AND CATS magazine of the Kingdom of the Cats. Do you know it? Hi Baron Catkinson! Thanks for stopping by! What is Kingdom of the Cats?? Being a cat-lover, Cat Island sounds like my kind of place. Good toi know that they have survived this disaster. And I hope they got the donations that they needed.